Steve from Gourmandistan shook his head incredulously and made a face. A few weeks ago, Steve was in town for the Roger Smith Cookbook Conference and we were talking “food blogger shop” at Roberta’s over craft beer and aioli-coated fried sweetbreads. 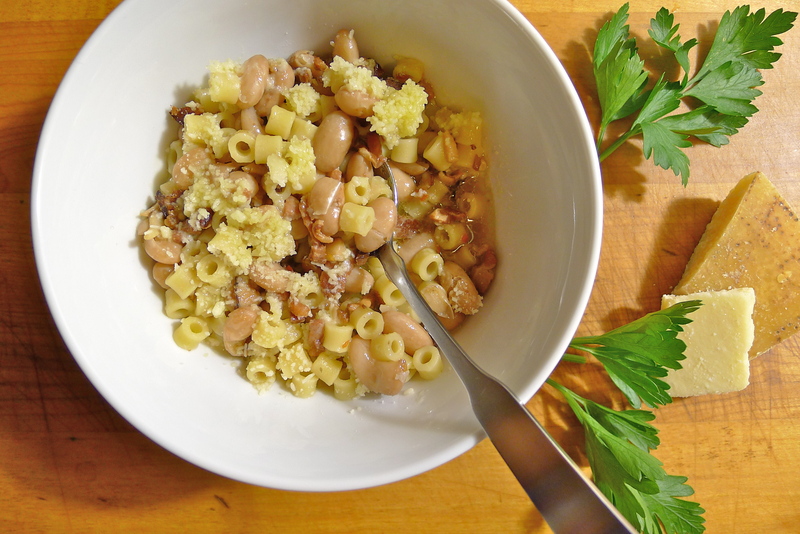 I love pasta e fagioli, affectionately known on these close-to-Jersey shores as pasta fazool. Translated simply as pasta and beans, the name of this humble Italian dish belies its power to soothe and satisfy. Pure alchemy occurs when the nuttiness of the beans Vulcan mind-melds with the pasta in rich rosemary and bay-scented broth. It is warm, wonderful comfort in a bowl and in these waning days of winter, it is the perfect dish. My current favorite version of pasta e fagioli is from Mario Batali, who starts off his recipe by asking you to mash up a wad of fatback with the back of a spoon until you have a nice and smooth porky paste. Very Italian. The subject of our mutual alarm was from British celebrity chef Nigella Lawson — not Italian at all. Although I like her writing, her recipes leave me cold . . . and extremely skeptical. Like this one for pasta e fagioli in which she asks you to use a “popsock” — also known as a knee-high nylon stocking — as a herb sachet instead of good, old-fashioned, food-safe, heat-resistant, and dependable cheesecloth. I am always on the lookout for a new variation on pasta e fagioli. Recently, New York Magazine published one from Jonathan Benno in which he solves the fresh-herb-removal problem by infusing the stock with Parmesan rinds and aromatics and then straining them all out before use. Benno recommends soaking the dried beans for two days in the refrigerator instead of just one day on the countertop. I’m not sure if the additional day of soaking affects the taste, but I did notice that the beans cooked faster and more evenly. The beans were also creamier. Heirloom beans are best, but regular old beans work just as well. Traditionally, borlotti beans — also called cranberry beans — are used in pasta e fagioli, but cannellini beans are a good substitute. To Benno’s recipe, I have added bacon. Because I can never resist adding bacon to everything 🙂 You can omit it and the soup will still be delicious. This soup is not difficult to prepare. However, it does require some advanced planning. Be sure to read the recipe closely before beginning. 1. In a bowl large enough to fit the beans comfortably, cover them with about two inches of cold water. Soak the beans in the refrigerator for two days. 2. When the beans are done soaking, drain them. 3. Combine the chicken stock, the Parmesan rinds, the fresh herbs, and the bay leaves in a large pot. Simmer everything together for about an hour. Do not the let stock boil. Strain the stock and discard the Parmesan rinds and herbs. 4a. If using, brown the chopped bacon ends in a large skillet until most of the fat has rendered. Drain the bacon bits on paper towels. 4b. Add the soaked and drained beans, the bacon if desired, the dried oregano, and the crushed red pepper flakes to the strained stock. Gently simmer the beans for between 1-2 hours. When the beans are done, they will be creamy in the center. Do not let the liquid come to a boil or the skins can burst. Skim the surface of the soup if and when necessary. Adjust the seasoning. 5. When the beans are tender, add the dried pasta to them. You may need to add more stock or water if the level of the liquid in the pot is too low. When the pasta is al dente, turn off the heat. To serve, heap a generous spoonful of freshly grated Parmesan on top and finish the soup with a drizzle of good extra-virgin olive oil. Ugh, of all the plasticky things I don’t want in my soup, a nylon stocking is way up there! I LOVE this herb-and-cheese infused broth, though–I’d just like to drink it! I know! It’s beyond foul and knowing that, I would never eat pasta e fagioli at Nigella’s house. At first, I thought that she was trying to be ironic. Now I suspect that it written in earnest. She must have thought it was quite clever. But it’s not clever. It’s just gross! Benno’s infused broth is a stroke of genius. I had a smack-hand-on forehead, why-didn’t-I-think-of-that moment! But then you went all Trek on me with the Vulcan mind meld and I knew we were back on safe ground. It’s got all Autumn-y down here at Possum Creek, so I’m going to find all these ingredients today and whip myself up a batch of this good-looking soup. A wallaby has eaten all my thyme, so I’m hoping a friend still has some in her garden. And yeah, we’ll be using bacon! If you make it, please do let me know how it goes! This dish looks amazing! Gosh, Daisy, if I hung out with you on a regular basis I would probably get some meat on my skinny little body 🙂 . Thanks for the kind comment, Brie! I have a reputation for fattening up my friends 🙂 Come on over! This is what Italian New Yorker’s call ‘Pasta Fazhool’ isn’t it? Aren’t we all being a little hard on Nigella here?!? Nylons (there are different types) melt at well over 200 degrees celsius, more than twice the boiling point of water. Like nearly all polyamides they are pretty tough in molecular terms so not going to fall apart leaving gunk in the ‘soup’. Plus nylon doesn’t leak dye as much as cotton and won’t have required a lot of bleaching – ever wonder how cheesecloth got to be so white? I’m sure la Nige didn’t mean a used one or even if she did I bet she’d wash it first. When one considers all the industrial processes involved in the making of all the utensils in our kitchens surely a bit of old nylon’s not going to cause any more harm!! Love the dish though and might just try with a pop sock so I can report back!! I would love it if you tried it with a popsock! I am so curious! Well… I do have a surfeit of smoked Welsh bacon coming my way soon (amazing stuff nothing to do with supermarkets the height of artisnal food production) so the time may be nigh! Oh yes, plenty of delicious Welsh salt mash lamb. The country’s cheeses are also starting to make a, well-earned, name for themselves. Oh the Dandy’s all excited now – hamper!! I agree: Welsh salt marsh lamb is lovely. If I remember correctly, the lambs should be gamboling around soon! The cheeses are also wonderful. A while ago, I used to spend a fair amount of time in Wales and remember the local products well. In any case, I very much look forward to hearing more about what is in the hamper! What Steve didn’t know or doesn’t remember is that, a million years ago, when I was in law school, I used to do the Nigella trick when making chili for parties. With only brand new stockings, mind you. 😉 In those days, I’m not sure where one would have gotten cheesecloth here in the hinterlands. There’s no excuse for it now though. Your fazool looks great, even without the nylon! Haha! Well, I am glad to have the use of clean nylon stockings in cookery confirmed and validated! Excellent question. Do they even make those anymore? Apparently so! Though it looks like the plastic egg part was discontinued in 1991. That seems like a really long time ago, doesn’t it? Aha! One of the most notable events in the Bush I era. I just googled what happened between 1989-1993. A lot of very depressing stuff, which probably contributed to 41 being a one-termer. The pop culture highlights (because the political and world event ones were just too grim) included Quantum Leap, Doogie Howser MD, Saved by the Bell, and Whitney Houston and Pearljam fighting for the #1 spot in Casey Kasem’s Top 40. Your version (minus sock) looks better. Why make things fussier than they need to be? As for nylon, some cooking gear is made from it. The question is not its’ melting temperature, but is it a FOOD GRADE plastic? L’eggs would not pass the test. Ah yes! I was so focused on it melting or falling apart, I didn’t even think of it being food grade plastic, which it is not. Like those people who say you can brine turkeys in trash bags. You can, but you probably shouldn’t! Thanks for that, Scroungelady! You’re the best! I now realize I understand neither the melting point of nylon nor seemingly what made up my bouquet garni in days past. I also don’t understand why you’re making my childhood food (my mother also pronounced it “fazool”) and I’m making yours (dim sum). Did some sort of cocktail “Freaky Friday” happen when I was in NYC? Hilarious. Maybe it does come down to terminology. “Popsock.” “Corpsed.” She may as well suggest you mug an elderly lady for her knee-highs before cooking. Gah. And I agree: why not use a cheesecloth sachet like a NORMAL PERSON? Nigella may be hot, but I don’t fancy her socks. Okay, tangent. 🙂 I like this “Freaky Friday” theory, BTW. Your comment about mugging an old lady for her knee-highs made me laugh hysterically and choke on my sparkling water! Doesn’t that just sound like a Monty Python skit? The lads popping out from behind a bush and assaulting the elderly for their hosiery? Yes, I think Steve and me swapped food brains . . . mmmmm, braaaaaaiiiiiiinnnnnssss! And I completely agree: Nigella is hot. I’m girl-crushing. Mugging the elderly almost makes the popsock worthwhile. 😀 Did you see the magazine cover with Nigella covered in caramel on it? Kind of like Carrie, but with Nigella, and hot. Haha! Totally like Carrie but with Nigella and caramel! I was waiting until after dinner to comment on this but, no, I’m hungry all over again looking at those photos. That second photo of the broth in particular looks beautiful!! As for Nigella and her stockings….. *sigh* They may not melt in the heat, but the mental image really is very unappetizing. I’ve been watching her recently on The Taste, as I have a complete obsession with both food, chefs and reality food shows, but, like you, she leaves me a little cold. She does what she does well, I suppose, but she’s not someone whom I would personally turn to for recipes. Thank you, Kafka! Yes, the idea of a floating bundle of herbs stuffed in a nylon stocking isn’t the most appetizing image is it? I watched one episode of The Taste and can’t seem to muster up much enthusiasm for watching any more. But I kind of feel this way about a lot of cooking shows. I just get kind of frustrated with the editing and I hate seeing the stress and pressure put on these poor people to perform or be eliminated. I do like Nigella’s own show though, simply because she’s so . . . um . . . bouncy. Yes, I have read Bill Buford! But only Among the Thugs, not Heat. Adding it to my reading list now! Thank you! Ps. Come back to New York! You would LOVE Lincoln! Open kitchen. Beautiful space. Technically flawless food! I will! And I would absolutely love to meet up for perfume sniffing! That sounds like so much fun. Food and cocktails are involved too, right? 🙂 Book the ticket!!! Lovely dish! I must agree with you (and most of the readers) about the stockings… what is the point of that? I usually tie my herbs with kitchen twine, and tie the other end of the twine to the handle of the pot. That way, I don’t need to fish out some weird sock out of my soup, and all the herbs still stay together. I love pasta i fagioli, such a comforting soup for a day like today: just woke up to my first March snow in my entire life! Hi Darya! Thanks for the comment! Yes, I don’t really understand why you would choose to use a nylon stocking when (unbleached) cheesecloth or twine are readily available. Maybe back in the day when it was not as common, but now? As for twine, I find that if it is something like thyme or rosemary, enough of the leaves fall off that I think to wrap them up. But I’m fussy like that! And congratulations on your first snow! Take pictures! Yes, we got snow a few days ago too! But we’re pretty used to bizarre weather in New York. Doesn’t it feel like this winter is dragging on? The infused broth sounds like such a great idea. I just made pasta e fagioli this weekend. Can’t wait to this this recipe the next time I prepare it. Thank you, Karen! The infused broth is a wonderful idea. The Parmesan rinds make it really rich and fragrant. If you try, do let me know how it goes! Great recipe, looks awesome (and we are all for adding bacon). I’m sure the addition of a nylon sock would have added nothing to the deliciousness of this creation! I agree about Nigella – she spends too much time trying to get it on with her fridge to focus on the food she is producing. She is very entertaining to watch though! But it’s true: I think the nylon sock adds nothing. It’s a good story, but maybe better as one used to introduce the recipe? I think that I would be more receptive to this trick if she had mentioned that you can use it if you don’t have or can’t find decent cheesecloth! I never thought to use parmesan rinds. That’s super smart. I’m a late bloomer when it comes to parmesan, I used to hate it but after I found out that cheap parmesan is nasty and good parmesan is wonderful, I’m a convert. I always have a block on the go. As for Nigella, I’m not sure if she can be taken seriously but I admit that she has a couple of strong target markets smitten. Every thing she eats is orgasmic. Oh yes! Good Parmesan is a must-have! Thank you so much! Thanks for the link as well. I will check it out! I always get hungry reading food blogs. Humans are visual creatures after all! Thanks for the kind comment, Kay! The idea of using hosiery in cooking is a little too avant-garde for me as well. The only way anyone would use that stocking is if they’d enjoy the taste of feet in their food. I hope no one with feet that smell as bad as Kimmy Gibbler’s get any ideas! I haven’t thought of Kimmy Gibbler in years! That’s not the actress’s name, right? I wonder what she is up to now . . . Her name is Andrea Barber. She stopped acting to go to school and start a family. She reprised the role of Kimmy for this “Funny or Die” sketch (along with Dave Coulier, who played Joey). The sketch was awful, but she looked the same as she did when she played Kimmy back in the ’90s. Hasn’t aged at all! That is amazing. I am totally going to google that right now. This dish looks like the ultimate carbo-cheesy-comfort food! It screams “Eat me and I will make your depression disappear!” This dish looks so much better than a bottle of Prozac and ten 50 minute therapy sessions. Does it make uber awesome tasty leftovers or does it get mushy? It is AWESOME leftover! Yeah, the pasta does get a little softer, but it’s fine. Benno’s original recipe calls for cooking the pasta separately and spooning the bean and broth over them — which I guess would solve any mushy pasta problem. This looks really good. I didn’t appreciate beans until recently. Pasta and beans…what a satisfying meal.